Puzzling Queen: Famous In Japan? 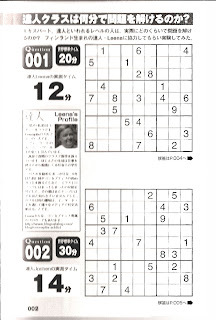 I have been featured in a Sudoku book. Conceptis Japan made a book for a Japanese publisher, Kasakura Shuppan. 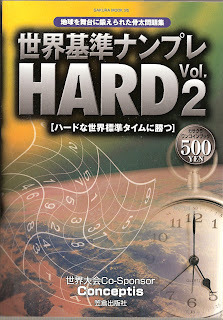 In the book they introduce a puzzle friend who has solved four of the puzzles and his/her solving time is revealed beside the puzzle. Chie, the manager of Conceptis Japan, asked me if I knew someone who would like to get introduced there. I decided that I could as well do it myself. So here are two of the puzzles I had to solve. Solving them as fast as possible was more stressful than I thought. I usually pay no attention to the clock. The hardest one took me 28 minutes! When I showed the book to my family, no one was thrilled to have the book with my autograph! Way to go, and thanks for helping Conceptis! That is so neat. I'm excited for you. Good work.